CLAFLIN – Central Plains senior Layne Bieberle is widely considered eight-man football’s top receiver. But Oiler coach Chris Steiner is quick to mention the program’s other talented wideouts, several whom are tall, lanky and quick like Bieberle. In 2013, Michael Lamatsch was actually Central Plains’ top receiver at the start of the season and finished with 22 catches for 356 yards and four scores for a 9-2 team. On Friday, the Oilers displayed their receiver depth in a 42-24 season-opening home victory against Central Prairie League foe Victoria. Central Plains is ranked No. 4 in Eight-Man, Division I and Victoria stands second in Eight-Man, Division II. Junior quarterback Braedan Crites finished 14 of 32 passing for 242 yards and three scores with one interception. He led the Oilers with 66 rushing yards and two scores with many of his yards coming off great blocks on the edge from wide receivers and ends. Bieberle hauled in eight catches for 120 yards and all three TDs, also recovered a fumble and had a 32-yard punt return. Lamatsch finished with four catches for 74 yards, all in the second half. Junior Hunter Ingham collected a 24-yard catch and sprung Crites for 14-yard score in the first half, the Oilers’ longest run of the contest. Lamatsch made a huge, game-turning play to open the fourth quarter. 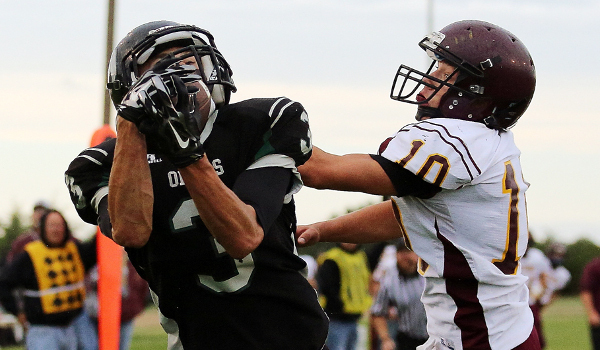 Victoria closed to 26-24 and Central Plains faced a 4th-and-6 from the Knights’ 17-yard line. Lamatsch had a 16-yard catch off a quick slant and ran to the 1-yard line. Central Plains had thrown Lamatsch several comeback routes, a play Lamatsch likes. Steiner noticed Victoria was giving Lamatsch “tons of space” and looked for something quick to isolate him. Victoria coach Doug Oberle said he had the Knights “play a little soft” on the edge and tried to keep to receivers in front. Crites scored on the next play, and then Lamatsch caught a two-point conversion pass to put Central Plains up 10 points. With 9:01 left, junior Jacob Warnken, a transfer from Hoisington in his first varsity game with the Oilers, tallied a 2-yard score for the final points. Warnken can play in the backfield and at receiver, too. Victoria led only at 6-0 when senior Bryan Dome returned the opening kickoff 69 yards and Lane Kisner scored from a yard out. Crites misfired on his first two passes, but found Bieberle for his first completion on a 23-yard TD in the back of the end zone that tied the game at six late in the first quarter. The score came after Knights punter Eric McAlonan couldn’t handle a snap and Central Plains had a short field, one of several fumbles for the Knights. The Oilers led 26-12 and stopped Kisner on 4th-and-goal inside the one on the final play of the first half. After the break, Victoria closed to 26-18 on an 11-yard TD run from junior quarterback Brady Dinkel. Dinkel paced Victoria with 70 rushing yards, but completed 3 of 11 passes for 24 yards. Dinkel moved the deficit to 26-24 when he intercepted a pass that bounced off Bieberle. But Victoria couldn’t tie the score when its two-point conversion pass failed. Late in the third quarter, Dinkel fumbled on an option pitch and gave Central Plains a short field at the Knights’ 21-yard line. Four plays later, Lamatsch caught his critical fourth down grab that changed the game.